Monumental and decorative animal painting developed in Antwerp in the 17th century in the immediate circle of Rubens. Snyders, whose workshop was famous for this type of work, often also collaborated on the animals, flowers, and fruit in his friend Rubens's paintings. The rendering of materials such as the fur of the fox, the plumage of the bird, and the transparency of the glass jar add to the interest in texture. "The Fox and the Heron" is a story from Aesop's Fables. 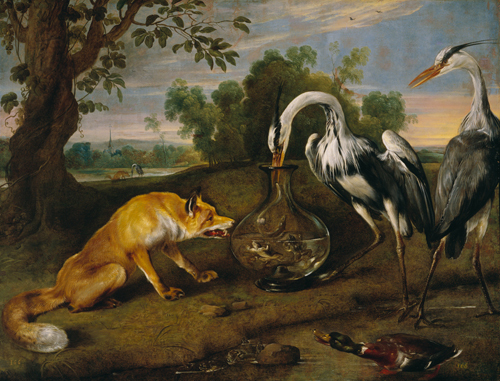 In the background, the fox invites the heron for dinner and offers only a bowl of soup, impossible for the heron to eat. In the foreground, the heron in turn invites the fox. Dinner is served in a long-necked glass jar and the fox can only lick the outside. Moral: One bad turn deserves another!